Use of the Clinical Research Facility – Please contact the Clinical Research Facility for approval. Attributing the costs of health and social care Research & Development (ACoRD) When costing for a study or grant application consideration should be given to the split between research costs, service support costs, treatment and excess treatment costs as outlined in the following ACoRD guidance. For all studies and grant applications you should contact one of the following: Head of Research and Development Finance, Research and Development Accountant or the Research and Development Finance manager . Research and Development are in the process of developing finance training: if you are interested please contact the Research and Development Finance manager. 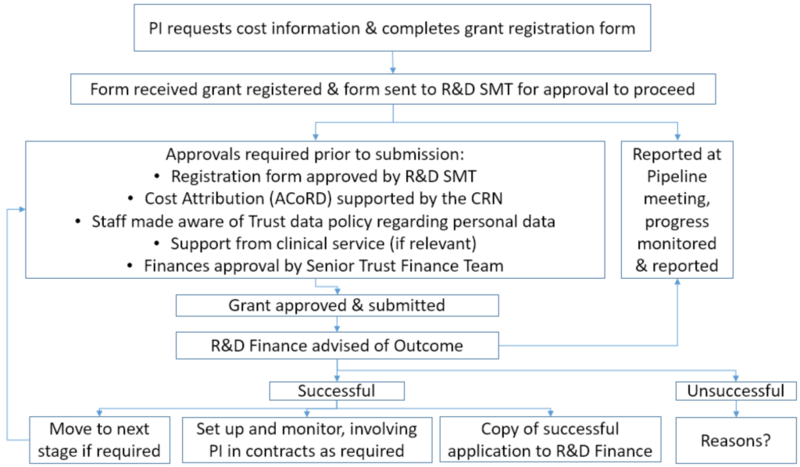 Download the grant proposal registration form (needs MS Word), complete and return to the Research and Development Finance manager to apply for a grant.